Death is a robber. It steals into your life, taking from you a precious gift that can never be returned. Today, this thief has visited me. In the place of a loved one, I face an empty space, one that will never be truly filled again. Ever. There is the shock of crying that takes over me. This is supposed to be healthy, a normal reaction in the initial time of mourning. All the experts on this kind of thing seem to say that, so I’ve heard. But all the oceans of tears I shed does not fill the vacuum that death has carved into me. The bloodletting of weeping threatens to drown me. I reach for an anchor, anything to grasp on to remember I am still amongst the living. So I sit, watching the grandfather clock. Its pendulum ticks a metronome that calms me. Somehow, being this conscious of time passing is soothing to me. It is an acknowledgment that time still exists, and I am still part of that construct called time. In this world that has changed, nothing seems real anymore but this passing of the seconds. Everything seems slippery, like I have no grasp on what I thought was secure in my life. Rooms once filled with life and memories feel gutted. Even with the noise of everyday life, it is too quiet. I have witnessed life pass into another stage, the one that the corporeal world calls death. Normally I can be blase in using that word, but to actually see it take place, I do not feel casual enough to utter it. I do not want to acknowledge it. Some call this denial. I have no words to which to describe it, not now. Words are as empty as the wind that has taken a spirit on its breath. Soon, I go to carve a grave. Nine years of life shared with this small friend that some would callously say “is only a dog”. As though friendship has to have a particular shape for it to be deemed worthy. Never mind what they say, my heart is heavy, and nothing feels real. I mourned through the death of humans, but I never saw one pass through life to death. Death was relayed through a phone call, but today I was summoned as a witness to its trial. I am too numb to speak a verdict. I wait, for what it is I do not know. Perhaps if I watch the clock enough, it will move backwards, to take me back to the time that I knew. Perhaps if I remain here for some time, what seems to surround me as familiar will render a verdict that nothing has changed. If I believe it hard enough, maybe I will turn to see a dog with a wagging tail, waiting for me to embrace him. But no, this does not happen. There is nothing but empty space. I begin to feel colder, and I do not want to accept what this might mean. Even the ticking of the clock has betrayed me to myself. Time. It passes by, and as it goes by, the seconds are creating a reality that I do not want. A reality without a friend I have loved. By his death, I have been recreated, for I no longer have an identity with him. There is ice in my heart now, my limbs frozen. Time, it has done nothing to change it. It is time for me to go now. 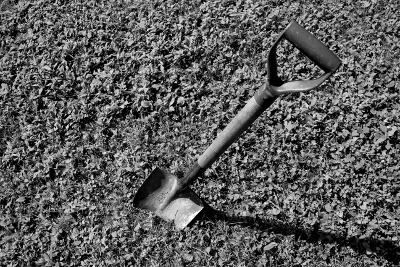 I go to dig a grave. I sigh, still wanting to hold onto the idea that if I stay here, the reality of death will pass by. But its grip has its icy hold on me. Time for me to leave, it says. The dance of life has gone into mourning. Beautifully and warmly written. Death is the culmination to the circle of life. It’s everyone’s destiny and expected, but never easy. And that goes the same for the loss of a family pet. Those precious, innocent creatures who do nothing but love and fill the owners life with joy. Death leaves a hole in our hearts. Other people or pets come into our lives, but the hole remains. It’s that special place of honor for the one who no longer sits by our side. Your story brought tears to my eyes as I can fully appreciate your deep loss and the emptiness you are experiencing. Three months ago, my little cat died. I buried a beautiful and intelligent pett aged 16 years. She was so very special, loving and full of joy. She brought happiness each moment we were together. When she died one night in my living room, she looked so peaceful and elegant. I found it hard to believe she was gone. She will never leave me though as I have wonderful memories of her. Your dog’s warmth and friendship will be with you forever. Keep the happy times in your heart and such memories will strengthen you and ease the pain you are feeling. Touching story. Many will relate. What a beautiful tribute to your loving dog. I shake my head and wonder when people tell me why I get upset when I see a dog suffering. After all, “it’s just a dog,” they tell me. When I put it into the context that at one point that dog breathed and felt joy and pain that’s when they think about it more. Sadly, the majority of humans don’t respect other living creatures, but thankfully I’ve managed to be friends with the minority who respect them. Your story brought back the death of my dog, Skipper, who was my boon companion when I was ten. A neighbor who hated Italians fed him ground glass, and he died overnight. I went to school stunned, and a sensitive teacher (I still remember her name, Mrs. Ducros, a kindly, motherly Cajun woman of great grace and intellect) called me up to her desk and asked me what was wrong. I told her and she hugged me close for a moment. She smelled like magnolias (I always loved that smell afterward) and she told me to go home for the day. he would make it right with the Office. “No one should have to go to school when there’s been a death in the family,” she said. I still pray for her, and hope other children might be so fortunate as to have such teachers. But I doubt it–she was one of a kind. Thank you all, for your lovely comments. I am glad the story was inspirational for you.